Fashionistas, when in Model Colony, pay a visit to Daughter's Couture, a designer boutique store that will customise some amazing ethnic, Indo-western and fusion pieces. Look! we found a super-cute peach lehenga with floral thread-work. Thinking of ditching the traditional look and adding newness to the good old lehenga? Check this out. This gorgeous boutique in KP is known for its classy bespoke outfits. We found this gorgeous lehenga with embroidered florals designs. be it a wedding or any other occasion, they will go out of their way to ensure that your outfits stand out of the crowd. We recommend you opt for pastel floral hues and intricate hand-woven patterns. This full-length silk lehenga with floral print from Betee Elegance at Clover Centre in Camp will be perfect for that last reception night. The outfit has a certain Indo-Western touch to it. If you’re not convinced with the blue dupatta on top, get it removed and turn it into a stylish sleeveless evening gown as well. 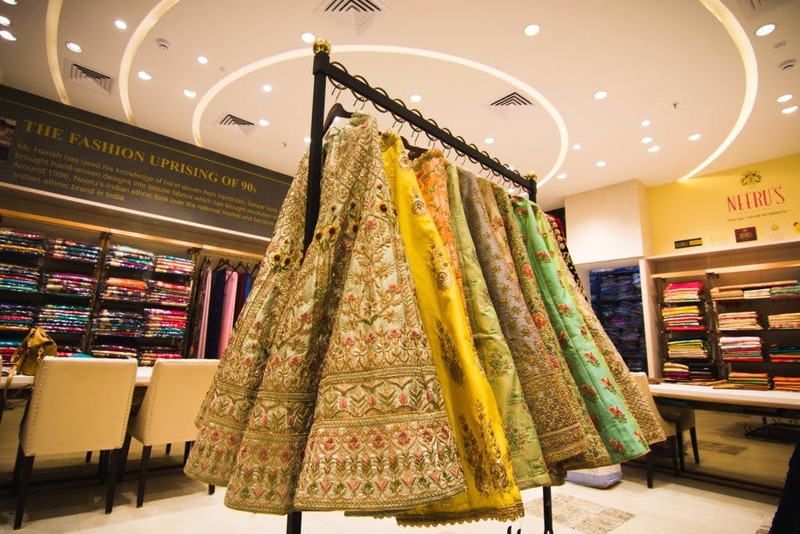 Situated in Phoenix Mall in Viman Nagar, Neeru’s is a breathtaking emporium bustling with bling, sizzling hues, pastels and flattering silhouettes. The eclectic range of lehengas and wedding gowns is an absolute winner at Neeru’s. Priced between INR 7,000 and INR 1.2 lakhs, the lehengas adorn intricate floral embroidery apart from other handwork types. The floral lehengas and lehenga skirts are to die for. Vamas Collection on MG Road is known for its ready-made as well as customised collection. We love their digital prints as well as dyed floral lehengas. Got a saree but no blouse to wear? You can get it all customised with prints and embroidery of your choice.